There are many ways that mold can make you sick. While some people aren’t very sensitive to it, living with mold can cause sickness for a long time. In this article, we will tell you what sort of symptoms come with mold sickness and how to know if you might be living with mold in your walls. The bottom line is this: household mold will make you sick. Even if you aren’t sensitive, it will still affect you in different ways. We will also tell you how to avoid getting sick from mold being around you in your home. Your local remediation contractor may be necessary to get rid of some mold problems, but there are ways that you can get rid of it yourself. One of the ways to help get rid of mold is an ozone generator, but you need more than that, too. We will tell you how mold makes you sick, what sicknesses come from mold, and more. If you have any of the symptoms that we will be talking about, you may have a mold problem in your home. Many people ask this question, only thinking that it might be something that just affects food and consumables. 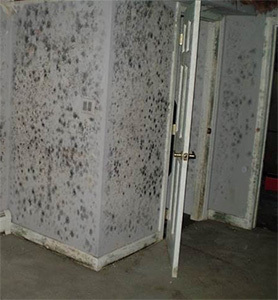 While this is a type of mold, there are also thousands of other types of mold as well. 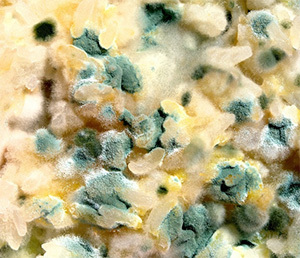 Mold is a multicellular fungus that spreads. There are thousands of types, as said, but there are only a few that are toxic to humans. Some of those toxic molds can grow in the house and cause a lot of health problems for you and your family. Mold thrives in spaces that have moisture and heat with very little ventilation. This is why a lot of it grows after water has touched certain spots. A flooded home has to be treated for mold regardless of the situation, unless it is torn down. Even if it’s just a water leak or humidity, a house can get easily get mold if not taken care of quickly. Mold releases spores into the air to spread itself further through the area they’re infesting. These spores are what cause the health problems in people. Even if you’re not sensitive to mold, you can suffer from a few symptoms of mold as well. Spores are what cause those health problems, getting into your lungs and wreaking havoc with your immune system and infection. While there are many sicknesses that can be attributed to mold, there are a few that are more common for it. Mold is an ancient fungus and has been around since the dawn of time, but there have only been a few scientific studies done on it. Therefore, it is somewhat difficult to pinpoint exact reasoning why it does what it does to our bodies. Do not underestimate the significance of mold infestation, though. Mold will most certainly cause a lot of problems for you and your family. There are many stories out there that show the hardships of mold, so don’t become one of them. If you experience any of these symptoms, you may want to get a mold test done on your home. Many of these things are due to many allergies, which can also be related to dust, pollen, dust mites, insects, and more. A clue that it could be mold is if you don’t go outside for a while and make sure you don’t come into contact with most of these allergens. If you’re still getting these allergy problems all year round, it’s likely mold somewhere in your home. While those are the more common attributes of mold exposure, there are other less common ones that may come up. Many people are sensitive to mold, including those that have allergies or lung diseases like asthma or mesothelioma. Many of these are not exactly tied to mold in terms of scientific research, but if you have any of these symptoms, a mold test might be a good idea. Lung disease is a problem for millions of people around the world. Chronic lung problems are almost year-round for many of those that suffer from diseases like asthma. Mold is no joke when it comes to these diseases, especially if there are immune system problems there too. It can be hard to deal with, but lung diseases can lead to mold infections. There is a condition called hypersensitivity pneumonitis, which happens if your lungs are very sensitive to spores of mold in the air. Not only that, but it also causes sensitivity to other microbes as well, including things like pollen and dust mites. Anyone with these sorts of conditions must be very careful when it comes to mold infections. Mold can be dangerous to you and your family. This includes your pets. People with pre-existing lung diseases will have a harder time coping with mold than those without. However, that doesn’t mean that you won’t be affected by it as well. Mold can cause problems for anyone, even those who are healthy individuals. Never underestimate a mold problem. If there are any sorts of water damage or moisture in your home, be aware that you could get mold in your home. This is especially true if you don’t have very much ventilation. Any water damage that you come across, you should fix immediately. Otherwise, it will most certainly cause mold to grow and spread through your home. Even if it’s sanitary water, it can deteriorate over time.